Make your kitchen the heart of your home with Dream Doors Canterbury. Speak to our designers and view our stunning collection at your local kitchen showroom in Canterbury which services Whitstable, Herne Bay and the surrounding areas. A great kitchen is the heart of any home, so make your dream a reality with help from your local kitchen experts at Dream Doors Canterbury which covers Whitstable, Herne Bay and the surrounding areas. From design to fit, our professional team will help you create your ideal kitchen. 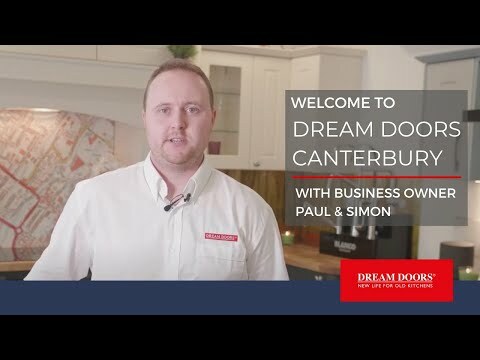 Paul and Simon, owners of Dream Doors Canterbury, will be on hand to help you create the perfect kitchen for your home. In our showroom you will find designs and styles, ranging from classic to contemporary, so you can find the inspiration you need to makeover your kitchen. Simon or Paul will be happy to talk through your ideas and help you design and build a practical but stylish kitchen that serves your everyday needs. At the Canterbury Dream Doors showroom, we house kitchen cabinets, worktops and appliances so you can see what is on offer, from monochrome kitchen spaces to traditional country styles. Classic and contemporary kitchen design doesn’t have to involve the replacement of an entire kitchen. New kitchen doors and worktops are an affordable option that can transform the overall look and feel of your kitchen. Even if you want to swap styles completely to a monochrome or high gloss finish, this can all be achieved on a budget with help from our expert design team. With us, you can achieve your dream kitchen for up to 50% less than the cost of a full kitchen refit. Why not pop into our Canterbury showroom to see what is on offer? Paul or Simon can visit your home to help you plan and design your new kitchen. Simply arrange an appointment so they can come and take your ideas on board and provide you with a free, no obligation quote. These visits are useful to help our kitchen designers understand your requirements and bring functionality into your space. Dream Doors Canterbury offer kitchen makeovers and replacement kitchen doors and worktops services in all local CT postcode districts in Canterbury. This includes the areas Canterbury, Harbledown, Rough Common, Sturry, Fordwich, Blean, Tyler Hill, Broad Oak, Westbere, Wingham, Chartham, Bridge, Whitstable, Seasalter, Tankerton, Chestfield, Swalecliffe, Yorkletts, Herne Bay, Herne, Broomfield, Greenhill, Eddington, Beltinge, Reculver, Birchington-on-Sea, St Nicholas-at-Wade, Sarre, Acol, Westgate-on-Sea, Margate, Cliftonville, Birchington, Broadstairs, St Peter's, Ramsgate, Northwood, Minster-in-Thanet, Cliffsend, Monkton, Manston, Sandwich, Eastry, Woodnesborough, Great Stonar, Richborough, Deal, Walmer, Kingsdown, Ringwould, Sholden, Great Mongeham, Worth, Ripple, Tilmanstone, Betteshanger, Alkham, Lydden, Eythorne, St Margaret's at Cliffe, Elvington, Dover town centre, Whitfield, Temple Ewell, Tower Hamlets, River, Hawkinge, Lyminge, Etchinghill, Capel-le-Ferne, Densole, Newington, Folkestone, Cheriton, Sandgate, Hythe, Saltwood, Lympne, Postling, Newingreen, West Hythe and Westenhanger.